Travel is complex. As professional agents, we will guide you the entire booking process. We use our education and experience to provide you with insider tips and advice on everything about your trip and destination. Unlike any website, we can tell you the best route or price from competing travel companies, and all of the best options for YOU. If anything should go wrong during your trip, we are accessible 24/7 by cell phone to help you. Travel is our passion and our life work. It's what we do all day every day. We have been to many of the destinations, resorts, off-the beaten path excursions and planned trips to the destinations you want to experience. Our first-hand travel experience, education, and ongoing training make us travel experts who can make sure your honeymoon or destination wedding turns out just the way you imagine, every time. Through our unique interview process we will counsel you about where to go, how to get you there and how the trip will provide the experiences you want to have. Whether you are looking for a sunny beach escape or an old-world European adventure, we recognize that no two honeymooners and no two trips are exactly alike. We take the time to understand your unique travel needs, interests and desires and translate them into your own personalized travel experience. Want to look at a few options and check for your budget? Click on one of the links below and then consult us. 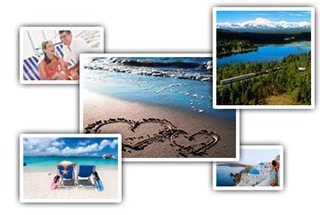 Remember – The Internet is for looking, a travel professional is for booking! Should I have a destination Wedding? Destination Weddings usually cost less than a traditional wedding. Traditional weddings today can cost from $10,000 - $20,000 and up. Explore the options for gettig married at an exotic location instead. 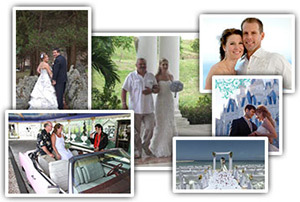 Many resorts offer free or reduced rate wedding packages depending on how long you stay. Cruise lines also offer weddings at sea. Generally you be able to save more money by purchasing a package to your wedding or honeymoon destination - air, hotel, meals, etc. all purchased together. We can create a wedding package for you AND your guests. Unfortunately, when guests are left to "fend for themselves" it is difficult to make sure guests get plans that are convenient, affordable, and close to "where the action is." By working with our experienced travel coordinators with negotiation skills, you generally receive a better deal for you and your guests than anything you could book on your own. We will provide flyers to insert in your invitations and can offer online booking as well for your guests. Your Honeymoon after the big event is more than just a detail, it is for the new bride and groom viewed as the Trip of a Lifetime. Like all of the details in your Wedding planning, trust one of our professional agents to help you plan your trip. We review with you budget, interests, time available and council you on the best options. Beyond what you can read in a brochure, or on an Internet Travel Site, our agents have personal expertise with honeymoon destinations and resorts: where you should stay (and where you shouldn't)... which on-site resorts and planners have responsive staff , etc.